A fourth place regular-season finish with 57 points, The Toronto Maple Leafs would first meet and defeat the big bad Boston Bruins in the semifinals of the 1948-49 playoffs, slating a showdown with the always dangerous Detroit Red Wings – a repeat of the preceding year’s final. Allowing just 5 goals in 4 games, Toronto easily vanquished Gordie Howe and Detroit to claim the Leafs eighth franchise championship, and third consecutive Stanley Cup victory. We have an especially attractive 1948-49 Toronto Maple Leafs Stanley Cup championship 10K gold ring, with this particular specimen presented to Leafs legend Tod Sloan during his rookie campaign! Size 11 with an approx. 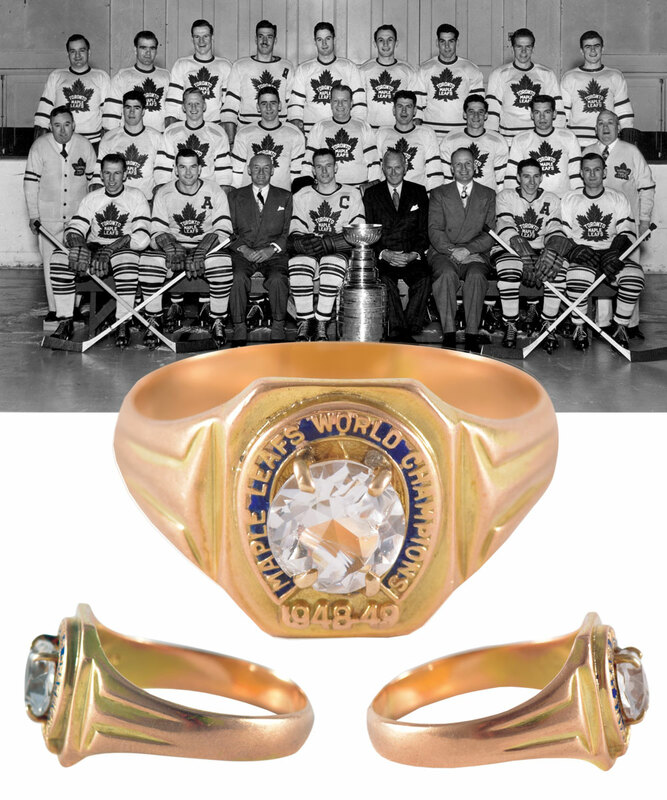 weight of 10 grams, a large zirconia sits centered over the plateau, encompassed by “Maple Leafs World Champions” in raised letters, with “1948-49” below. 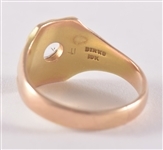 Each shank feature’s raised design, with the inner band stamped “Birks” and “10K”. An LOA from the Sloan family will accompany this important keepsake. We should also note that the ring has been re-sized at some point, with evidence noticeable along the band. Well worn with wear along the entirety of the outer band, a few deep scratches are visible within the inner band along with moderate to considerable surface wear throughout, with the large zirconia over the tableau chipped. As mentioned, 1948-49 was Sloan’s rookie season with the Leafs, as he had previously dressed for only a single game in 1947-48. Appearing in 29 games, Sloan would net 7 points during his inaugural campaign of 1948-49.